Have you seen vehicle features like adaptive cruise control, parking assist sensors and blind spot indicators in your auto repair shop? All of these technologies (and many more) fall into the new category of vehicle systems known as ADAS — Advanced Driver Assistance Systems. If you haven’t encountered ADAS yet, you will soon as the latest generation of vehicles makes its way into the aftermarket for service and repair. With the new technologies come new challenges and opportunities when the features need repairing or servicing. ADAS is impacting even common jobs that you may have in your bays right now. For instance, wheel alignments used to be simple, but many vehicles now require recalibration of the outside view cameras after a four wheel thrust angle alignment. Some of the technologies are so new and complex it can be difficult to know where to begin. No need to worry – that’s where ProDemand can help. ProDemand streamlines the search process by consolidating the information you need to understand, diagnose and repair these systems. You’ll find everything right where you need it, starting with the Quick Link ribbon on the very first screen in the software. Simply select a vehicle, click the Driver Assist -ADAS Quick Link button, and you have immediate access to a table listing all ADAS features for the vehicle and the specific components involved in providing those ADAS features. You might see some “common” components like cruise control module, park assist sensor and outside view camera, or more “unusual” ones like yaw/acceleration sensor, object detection sensor or forward looking radar module. 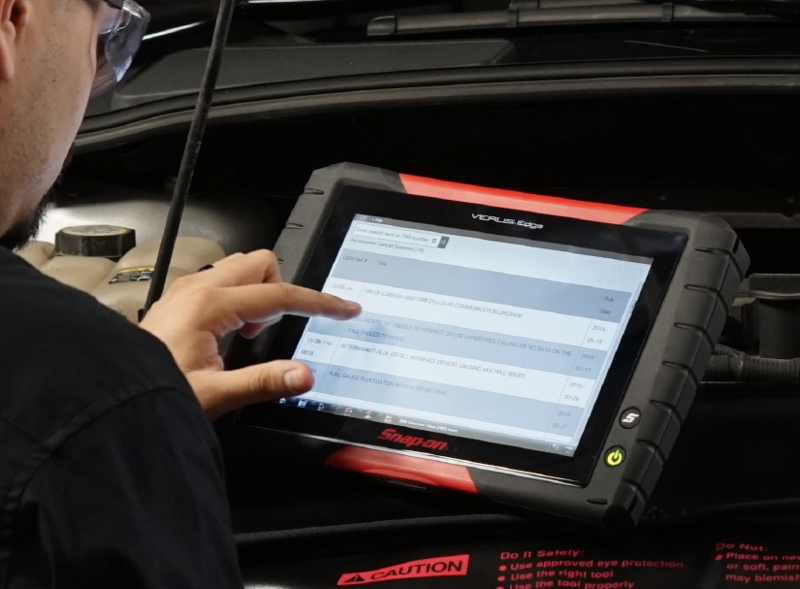 ProDemand has them covered, and lets you know if the components of an ADAS feature will require calibration, special tools, or scan tools in order to complete the job. The table format combines all the ADAS information for the vehicle, allowing you to understand the full extent of the ADAS feature at hand, as opposed to performing multiple lookups to find each piece of information separately. Select a component in the list and 1Search Plus delivers the relevant information in a user-friendly card format. Simply select a card to drill deeper into the details to complete the job with maximum efficiency. There is no needle in a haystack here, or long lists to scroll through; what you need is exactly what you see and what you get — instantly.